A Japanese word, bokashi means fermented organic matter. A method of recycling all food waste by fermentation is also known as the bokashi method, as well as, bokashi composting. Bokashi, as a fermentation starter, is added to the food waste (ratio of 1-to-33) in an airtight container (anaerobic condition) in order to ferment it instead of letting it rot. This is a lactic-yeast-phototrophic fermentation (not methane fermentation). EM Bokashi is used for various purposes, including as a direct soil amendment, besides fermenting food waste. EM Bokashi is an alternative and a complement to composting, and is an effective way to recycle all food waste, including meats, dairy, etc. 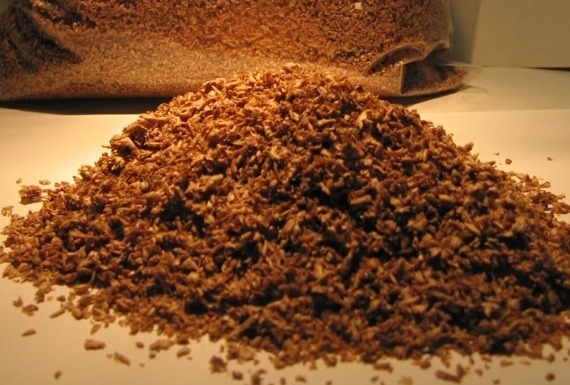 EM Bokashi can be made of one or more different organic materials, such as, wheat bran, rice bran, saw dust, etc. Any of these properly fermented materials can be used as a "fermentation starter" to ferment food waste. The brans, such as wheat bran and rice bran, fermented with EM are also referred to as "fermented bran". You can make your own EM Bokashi (visit TeraGanix.com for instructions), or you can buy ready made EM Bokashi. and for all other locations, see our Directory. Adrima is not affiliated with the above mentioned entities and is providing the above for informational purposes only.